Use Amplifi LR and HD routers together with one as mesh node? I have a U-shaped brick house, as shown below, with stars representing the Amplifi LR and mesh points, and the circle indicating my office workstation, where I would like to increase WiFi throughput. Is it possible to swap in AmpliFi HD routers in a wireless backhaul mesh role at the indicated mesh point locations, cooperating with the LR router and the existing LR mesh points? Can I expect improved throughput by doing this? Is an AmpliFi mesh network allowed to have more than 3 nodes total? @dale-visser Hi Dale! It can have many nodes, but there's a penalty with each hop. It seems like this shape could be effectively covered by two HD routers. Hard to tell, as there's no indication of scale. Would be interesting to see what RSSI you are getting from the router at each of these points on both bands. @ubnt-gunars It's approximately 5 to 8 meters, and there are 2-4 interior drywalls (not drawn), between each node. Relative distances are well represented. Both mesh nodes say 5 GHz mesh point band. The one closest to the router says 96% signal quality, while the intermediate mesh node says 48%. Your question prompted me to attempt to change the mesh point bands to 2.4 GHz, which then jumped it to 100% signal quality. I didn't really see any difference in throughput using speedtest.net (though that might not be the greatest test). Further question: Is the mesh point band what it uses its backhaul, or what it presents to clients, or both? I suspect it's just the band for clients, because I noticed my office system switching from 5 GHz to 2.4 GHz right along with the mesh point band. 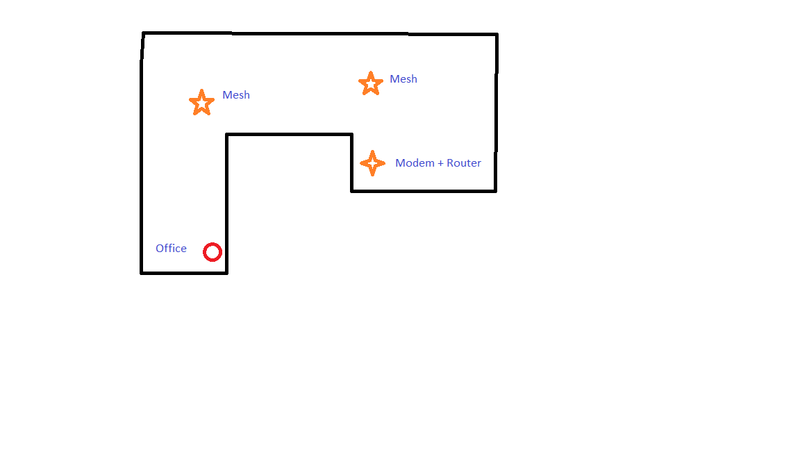 Do both mesh points connect directly to the router always, or do they try to connect to whichever node has the best speed? The mesh point band is used for both back haul and presenting an AP to clients...therefore there is typically going to be a 2x drop in throughput for each hop, even with perfect signal strength. Therefore, if I set both mesh points to different bands, they must both use the router for back haul. I've read elsewhere on the web that someone successfully added HD mesh points and got improvement. Buy some HD routers and use them as mesh nodes -- I think this eliminates the need to pick between the 2 bands. Actually run some CAT6 through my attic space to the office. Probably costs $$$ since I don't see myself doing it. Buy one of the Tri-Band systems I'm seeing advertised now. Will AmpliFi be offering one? @dale-visser the LR system couldn't operate both bands at the same time, so switching backbone also changed the band for clients. HD can do both bands at the same time. Mesh points decide where to connect based on signal strength, but they will prefer the router if the signal from it is strong enough. @dale-visser what speeds do you get at the office to mesh 1, mesh 2 and to the router? You can create additional SSIDs to test this. @ubnt-gunars Are you saying that if I get HD mesh points, they will work with my LR router and be able to use both bands? @ubnt-gunars I'll get some numbers for office-to-x, probably tomorrow. I actually have 2 laptops in my office. One has a 802.11b/g/n card in it, while my newer work laptop is full-on 802.11ac. I notice (using the AmpliFi app) that right now, rather than using one of the mesh points (both 5 GHz) they are both connected to the router over 2.4 GHz.